NEWPORT, Ky. — Tilly, Newport Aquarium‘s 1-year-old loggerhead sea turtle, is set to be released into the Atlantic Ocean on Wednesday. Her return to the coastal shores of North Carolina is part of Newport Aquarium’s participation in the North Carolina Wildlife Resources Commission’s Sea Turtle Project. Tilly weighs nearly 10 pounds as of Oct. 28, 2014. As part of the Sea Turtle Project, newly hatched turtles that do not immediately venture to water, and therefore are most vulnerable to not survive, are rescued and nurtured for typically one year until they are healthy and strong enough to be released into the wild. This program is crucial for the survival of sea turtles, which are federally protected and on the endangered species list. It’s estimated that only one in 1,000 sea turtles survive to adulthood. Tilly was hatched at the beginning of August in Emerald Isle, N.C., and was no larger than the size of a 50-cent piece when she was given to Newport Aquarium staff. A closeup of Tilly from Dec. 17, 2013. Tilly arrived at Newport Aquarium in October 2013. During her initial veterinarian visit at a North Carolina animal facility on Aug. 8, 2013, she was weighed at 54 grams, which is less than the weight of 11 nickels. Her most recent recorded weight was over 4.5 kilograms (almost 10 pounds), which puts above the threshold to be satellite tagged. 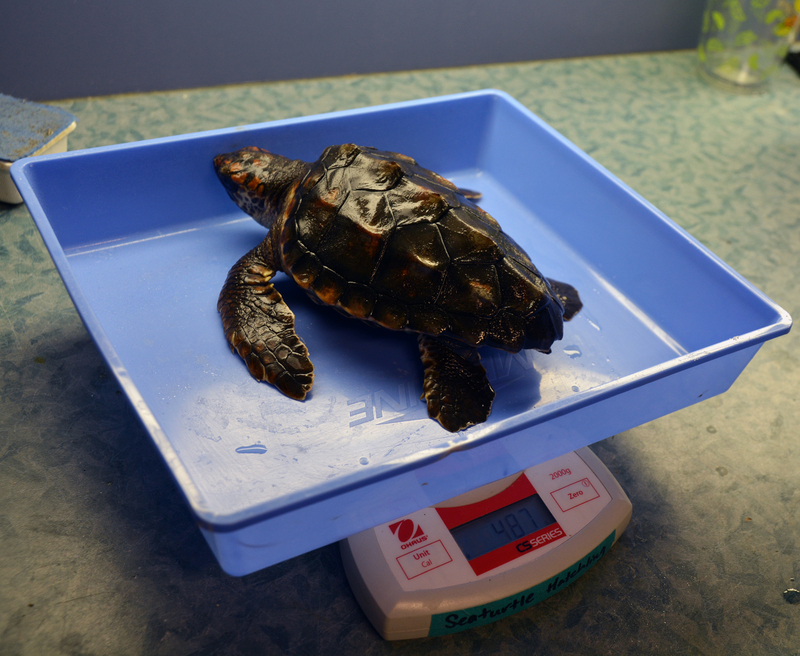 The baby loggerhead checked in at 487 grams on Jan. 6, 2014. A satellite tag will be placed on her shell on Tuesday, Nov. 4, which will allow people to track her whereabouts online. 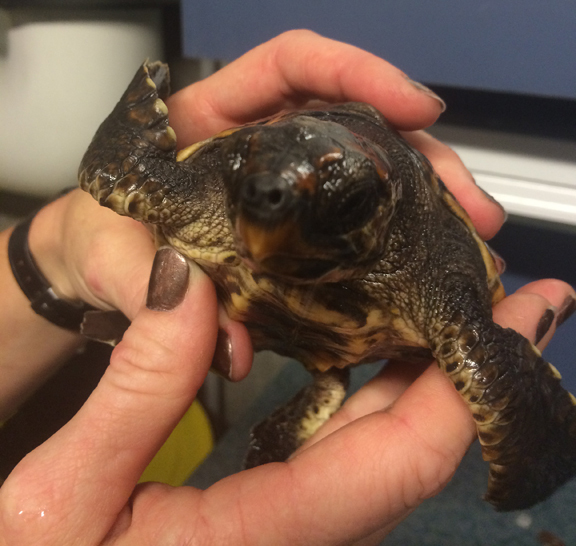 She will be the second turtle that Newport Aquarium has satellite tagged in its 15-year history. The last was Fisher in 2003. The WAVE Foundation, Newport Aquarium’s nonprofit partner, financed Tilly’s tagging as part of its conservation and education initiatives. After Tilly is released, Newport Aquarium staffers will return to Northern Kentucky with a new hatchling turtle next week and begin the adoption process all over. We will be sure to share the link to follow Tilly once it becomes available. 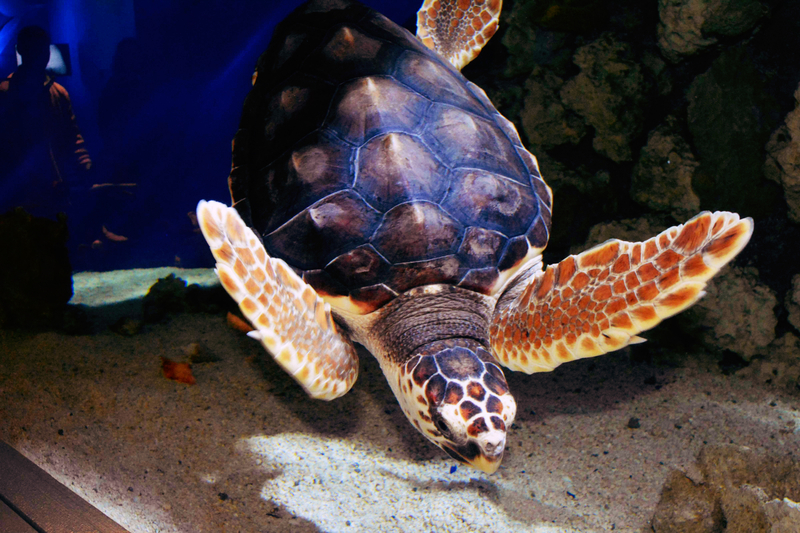 This entry was posted in Turtles and tagged Loggerhead sea turtle, newport aquarium, Tilly the turtle, turtle, turtles by NewportAquarium. Bookmark the permalink. Thank you for taking such awesome care of Tilly! I am hoping to see Tilly back at the NC Aquarium in Pine Knoll Shores before the release on Wednesday.